One of the greatest creations of the 20th century was print-on-demand. This amazing ability for any company to put their personal brand, logo, and/or tag-line on almost any type of household, personal, or novelty item was a major breakthrough in marketing. It started as a trend, and then stuck and became a thing. And today, as much as we would love to think that the sometimes cheesy pieces of swag we give away in the name of marketing are not passe, there are few other more cost effective ways to spread the word and show company pride. The printed swag that people will be drawn to and actually take home with them needs to be functional and either fun or aesthetic enough to have staying power with your targeted consumer group. The purpose of these things, after all, is to be remembered- thereby selling real goods or services. Swag needs to pay off. And while it can be very difficult to measure the exact net return of any marketing effort, at the end of the day you should have some confidence that the money out equals money in. Lucas Guariglia, co-founder of Rowboat Creative, points out a 2018 promotional products census that shows 89% of consumers received a branded promotional product within the last six months before making a purchase. Of those consumers that received the branded product, 79% of them researched the brand. “What is extremely important about looking further into the brand is that a connection/relationship has already begun between business and consumer,” he says. Who is my customer base, real and ideal? Age, lifestyle, etc. Is there something that everyone in my customer group uses? What is my budget going to allow for right now? What is my distribution method for the swag? These are not the sole considerations, so if you are like me, you will want to research this a bit before jumping in. Luckily, there are well written articles that can help you discern what will be right for you and your company. (Source). If you are investing in something that you expect people to put on and use, one of the most important things that you can do is make sure it is well made. There are two types of wearable swag- clothing and accessories- and both should be an extension of the lifestyle your brand promotes. The best way to assure that you are getting the quality you’re after is to have samples in your hand that you can see and feel. If you do not trust your judgement in quality workmanship, get someone to help. Talk to your swag salesperson about what you are looking for. With quality comes a higher price tag, so know what your breakpoint is upfront. Make sure before you place your order that you examine the way your logo and/or company name is printed. Pay close attention to the details. When choosing apparel, remember that people come in all shapes and sizes. Some of the most simple choices you make can quickly become complicated orders. For instance, flip flops are fun but you can’t take a one-size-fits-all approach with this type of swag. Hats, on the other hand, you can. 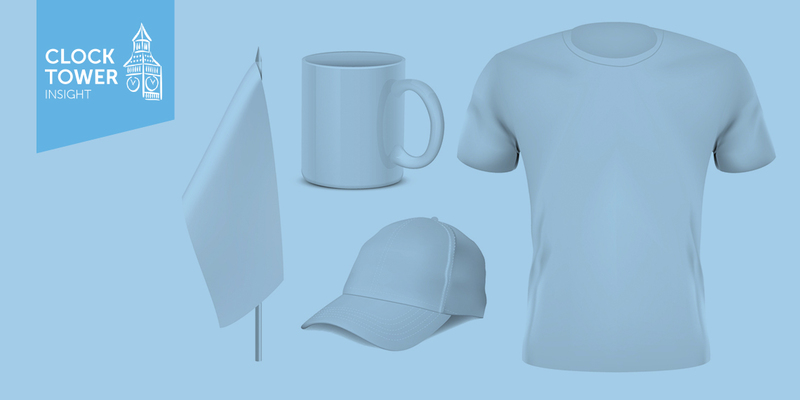 T-shirts and polos are some of the most common wearable items you will see handed out. Socks and yoga pants deserve a look, as well. Fleece vests are also an interesting item that most people will actually use. “The key to that approach is to create a completely premium look and feel no matter if we are dealing with smaller startups or enormous big box brands selling hundreds of thousands of units monthly to vendors or direct to consumer,” says Guariglia. Then there are functional accessories. Items like backpacks, lanyards, and all types of bracelets that serve various purposes from parameters and flash drives to key holders and fashion are popular pieces of swag. Sunglasses are another interesting idea that is both fun and functional. Quite frankly, print-on-demand apparel is only limited to your imagination and your budget. One of the best ways to explore the possibilities is to get on Pinterest and just browse. The large majority of swag handed out by companies is not wearable, but still functional. Probably more branded pens are sold, and then handed out, than any other single item in the US. It is tried and true, but there is nothing necessarily exciting about a plain old pen. However, there are definitely some really interesting items that you can give away to help promote your brand. Chapstick, or lip balm, is a particularly effective item to brand. Tumblers that can keep drinks hot and cold are another functional item that everyone can use. Traditional items such as pens have proved their sea legs over time. Guariglia notes that writing utensils remain as one of the top three products sold in the branded products industry. It is also worth looking at frisbees and other sporting goods that are portable and encourage outdoor play. Bluetooth speakers and headphones also make great branded swag that you can have printed-on-demand to help you raise awareness about your company. We at Clock Tower Insight look forward to helping you find the right pieces to give to your existing customers and attract new ones.